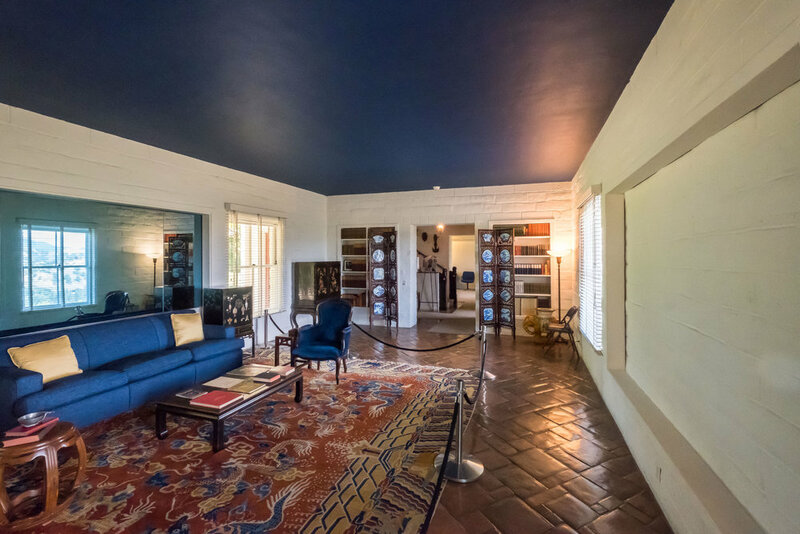 American novelist Eugene O'Neill, Nobel laureate in Literature, wrote at this desk while he lived at Tao House, his home near Danville, CA. It was here he wrote: The Iceman Cometh, Long Day's Journey into Night, and A Moon for the Misbegotten. His personal life mirrored the tragic and difficult people he wrote about. His marriages and his children did not fare too well. The daughter, Oona, he disowned because at 18 she married the 54 year-old Charlie Chaplin, actually lived longer and more fruitful life than her two siblings both of whom committed suicide. The second photo is of the living room just off the den where he wrote. The home is beautiful in a idyllic setting and a far cry from the lives lived here. It is a National Park site but rarely visited. There were 3971 visitors for 2017 the year we were there.